"Scalability" quickly entered the pantheon of flak jargon when companies like Oracle and PeopleSoft were dominating business technology news back in the early 90's, thanks to its futuristic-sounding yet moron-friendly ability to insinuate a system that would never need replacing, but upon which one could build and modify to suit your needs. That caveat aside, admittedly, one of the loveliest things about homebrewing is its stupidly delicious scalability. That one, with the materials on hand in most American kitchens, along with the same simple staple ingredients for making bread, can make beer on one's stovetop, is primally alluring. That one could also delve in to the degree of rocket science, working with a level of complexity of engineering and technique that rivals the largest brewing facilities in the world and still call it homebrewing is nothing shy of mind-boggling. Today's tale comes from that precipitous, barren no-man's-land somewhere between those two extremes, between pure simple impulsive joy and cool, experienced confidence. Today's installment of Fermentation Friday comes from that point when an intrepid yet amateur all-grain homebrewer decides to challenge himself, and fails disastrously, terrifyingly. Today's tale, in the vein of homebrewing horror stories, is about triple decoction mashing. I must warn you! This tale is loaded with geeky terminology that may prove more boring than terrifying. At it's heart, the concept of decoction mashing is deceptively simple. So simple, in fact, that as a consistent method for extracting stubborn sugars at various discrete temperature stages, one doesn't even need a thermometer to achieve quality results. Using the boiling point of water as a constant, the only measurement that's crucial is the volume of the mash that's being handled. In other words, rather than needing to know that you want to bring your mash up from "Blood-warm" to 140° F, you would need to know that you had to draw off one third of your mash, boil it, and return it to the tun. Want to raise it again? Pull off another third, boil it, and return it. Simple, ingenious, and downright medieval. Of course, there are reasons why hardly anyone uses this technique anymore (to the contrary of what the above link purports). But, in the search for what we deemed a proper, authentic pilsner, we took that path. Like Hansel and Gretel happily wandering into the forest only to come upon a delicious-looking cottage, we delved in while having no idea what wickedness lay ahead, nibbling ignorantly away while our trail of breadcrumbs has been cleared. For the most part, the whole activity of laying out the proper measurements for the correct volumes of water and weights of grains and the timeline and all that jazz went fairly smoothly. Sure, it all took extra time, but such is the nature of quality craftsmanship, right? Without needing to make any major adjustments, we successfully stepped the temperature up over the course of an hour and then let it rest for another hour. By the time we'd reached that final saccharification rest, though, a more experienced brewer would have noticed that something had already gone horribly wrong. How were we to know that the dense, cement-like porridge we'd created was going to be completely unsuitable for brewing? By the time we started the fly sparge, the mash resembled one of those petrified oat pucks you find in permanent residence next to the cash register at your local FTO coffee dispensary. The liquor began to run, the sparge arm began to spin, we opened the outlet valve... and nothing came out. Well, not nothing. A weak dribble of whatever cloudy liquid had managed to settle below the false bottom dripped out into the vorlauf pitcher, but nothing more. On the surface of the mash, however, hot liquor was quickly accumulating. Thinking some malt had managed to clog the outlet, I tried blowing back up through the outlet to dislodge it, without any luck. Jamming the mash fork into the grain bed did nothing to help the situation either. Cursing, I closed the sparge valve and dumped all the grains into the kettle so that I could examine the outlet from the inside and try to determine why it was stuck. (Could it be the high-grade imported malt concrete we'd prepared? Nah.) After managing to run some hot water through the outlet to assure that it was functioning, we dumped the mash back into the lauter tun to again try to get the sparge going, trying hard not to think about how badly the results had been compromised by all that handling of the mash. Again, the sparge arm starts up (after having had to refill and reheat the liquor tun) and the water level again begins to rise. And again, the same steps: blowing into the outlet, mixing it with the fork, dumping it into the kettle and cleaning the outlet from inside. And again, like an interminable tide of despair, the rising water refused to permeate the mash, the outlet wouldn't run, and our hopes for a sunny outcome to the day were quickly diminishing. When I decided to try to blow up through the outlet one last time, delusionally imagining that our efforts were in some way salvageable, the gods of brewing decided they'd had enough fun taunting me and unleashed their final insult. The bulkhead (ours being a simple rubber stopper with copper tubing run through it which has since been replaced), after having been manipulated far more than its design warranted, gave way. All the wort that had collected in the tun while my pathetic rescue attempts had been underway came pouring out, all over me, all over the ground, everywhere except for in the kettle. 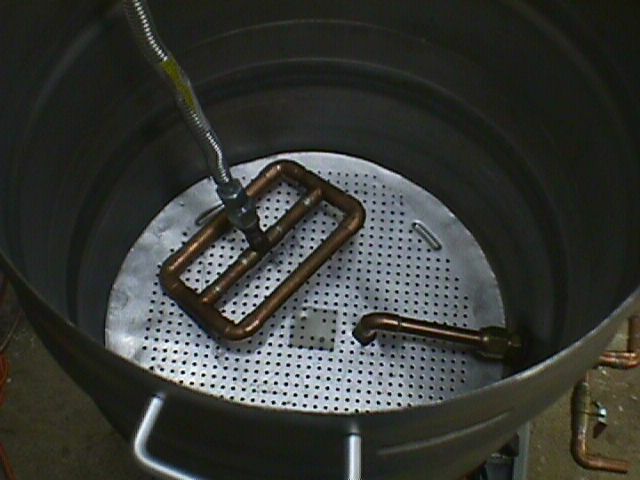 Like a brewer's caricature of a little Dutch boy, I desperately tried to reattach the bulkhead to stem the outpouring, but it was no use working against the hot and sticky flow of five gallons of liquid gold. We just watched it go. Haarlem would have drowned by my failure. It was an unmitigated blow to my brewing confidence, seeing a day's work collapse like that, literally watching money pour down the drain. And while it hasn't dimmed my enjoyment of all-grain brewing, we've never again attempted to decoct any of our mashes, a fact that plagues me every time I taste one of our doppelbocks or mãrzens and have that nagging feeling on the periphery of my tastebuds: Could this have been better, if only? If only. This month, Pfiff! has the privilege of hosting Fermentation Friday, a monthly blogging carnival gathered around the topic of homebrewing, originated by Beer Bits 2. If you'd care to participate, either post a comment here or send me an email, and I'll include your entry in the roundup that we'll be posting in the next day or so. That is terror. What a great mash paddle pitch fork! double points for the multimedia. Your world frreightens and confuses me, Rob.